Miller IDS stocks a full selection of supply products, from media to ink and toner. Additionally, Miller IDS offers a Managed Print Service program, for both large and small format printers, which combines the cost of supplies, parts, and service into one convenient monthly usage fee. We not only sell equipment, but we also provide service on those machines with our manufacturer certified technicians. All-inclusive service and supplies in one easy payment. The MILLER MPS program is designed with input from you, our customer, as you demand a program tailored to your speciﬁc needs regarding equipment acquisition, service, and supplies. The MILLER MPS program allows you to acquire HP and Xerox printers and multi-function systems through direct purchase, multiple leasing options, or rental agreement with signiﬁcant savings. 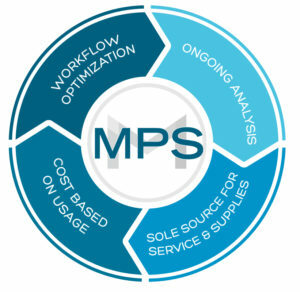 The MILLER MPS program bundles the printer’s supplies and service into a simple cost per square foot/ cost per copy price. This pricing enables you to stay within your budget, and only pay for what you use. Price can include 20lb. bond media, toner, ink cartridges, printheads and other consumables. You are busy. You don’t want to be distracted with making support calls or ordering supplies. Miller IDS also oﬀers the option of installing Sepialine Printerpoint or other meter reading software, that creates a streamlined process to provide simple and eﬃcient billing, service, support, and supplies, allowing you to focus on your business instead. Usage-based pricing – Cost per square foot, or copy, may include all consumables, including paper, toner, ink cartridges, printheads, etc., so you only pay for what you use. Flexible purchase, leasing, and rental acquisition options. Convenience – one monthly invoice for equipment, peripherals, and service.